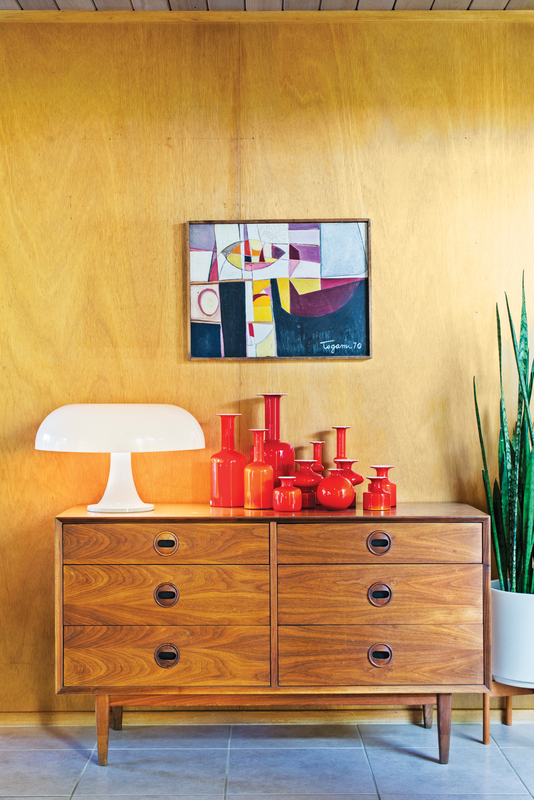 Seeking a modern shell for their mid-century pieces, a pair of collectors found a relatively untouched Eichler in San Rafael, California—and a built-in excuse to acquire more furniture. Mark Neely and Paul Kefalides’s living room is decked out with the couple’s vintage finds, including a Hans Wegner Sawback chair (the fur throw obscures an area needing repair), a George Nelson Ball Clock, a DF-2000 cabinet by Raymond Loewy, a light designed by Greta Von Nessen, and a suite of Brian Willshire wooden sculptures, one of Neely’s many collections. The couple’s vintage Stadio dining table is by Vico Magistretti for Artemide; the Eames chairs came from an old school in Palm Springs. 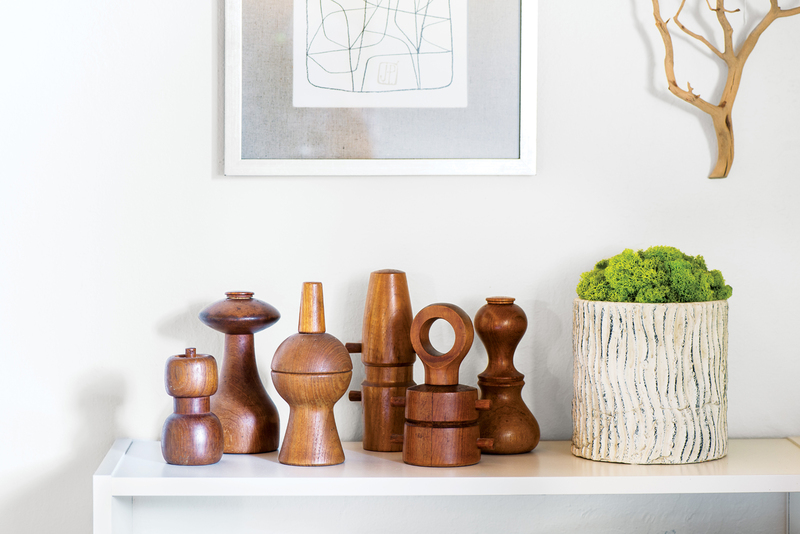 Neely has been buying Dansk pepper grinders at antique shops for the past ten years. The kitchen in the couple's home retains its original cabinetry. The exterior of Neely and Kefalides’s house is punctuated with a bright red door. A vintage chest of drawers supports the playful forms of a Nesso lamp, designed by Giancarlo Mattioli for Artemide, and a collection of Holmegaard ceramics. In the living room, a travertine-topped coffee table by Paul McCobb pairs well with the Florence Knoll Parallel Bar System sofa. The Josef Albers print over the fireplace is an original, scored on eBay. The beanbag chairs and outdoor sofa and chairs are from West Elm and the Case Study Museum Bench is from Modernica. “I love the look of mass plantings,” notes Neely, near Mexican feather grasses--which thrive on the sunny lot. The bed in the master bedroom is actually two single 1950s George Nelson Thin Edge beds--made from birch, enameled metal, and cane--that Neely bought at auction at the John Toomey Gallery in Oak Park, Illinois. "I love the contrast of the white wall with the wood and woven material," says Neely, who likes to keep the beding simple--often a paisley from Ralph Lauren--so as not to detract from the bed's strong lines. The white Vico Magistretti dining table is a focal point when you enter the house--"and a great spot to create assemblages of some of my favorite objects," says Neely, who changes the display every few weeks. Set atop a reversible Finn Juhl tray are ceramics from Heath and a Carl Auböck fruit knife with a cane-wrapped handle. Notes Neely:"I always keep a handful of tillandsia around--air plants soften and warm up the space." A textile designed in 1998 by Scandinavian designer Carl Johan Hane serves as an artful accent to the guest bedroom. Neely found the patters--Mobile, created for the Swedish textile company Kinnasand--as Skandium, in London. "I wasn't sure how best to display it. Then a painter friend of mine suggested I have it stretched across a wooden frame, just like artists do with raw canvas," he says. Graphic designer Mark Neely and gastroenterologist Paul Kefalides had spent years collecting furniture for their apartments in Chicago and New York before a career opportunity for Kefalides materialized in California. Neely was game but had one stipulation: “I told Paul, ‘We can move out west if you can find a modern house that the furniture can go into,’” he remembers. It was 2005, during the market frenzy. Kefalides lucked into a connection with Eichler expert and real estate manager Catherine Munson. She showed the couple a house that had only two owners since its construction in 1966; both were architects who had made the home’s conservation a priority. Neely and Kefalides soon found themselves the new owners of the roughly 1,700-square-foot post-and-beam house, designed by architect Claude Oakland for developer Joseph Eichler’s 500-plus-home Lucas Valley neighborhood in San Rafael, California. The pair had found their modern house, but the ongoing journey of furnishing and preserving it had only just begun. Neely: I remember walking into this house, and thinking, This is perfect. It felt like we had walked into the ’60s. It fit the furniture and still had all the original bones. Sometimes older houses are in states of decay and disrepair, but because the original and second owners of this house were architects, they maintained it very well. Kefalides: We were attracted to it because the setting was beautiful and the house proportions were smaller and more intimate. It had a warmth not always present in modern homes. It seemed like it had once been a cherished home. Once we moved in, we learned a lot about Eichler. He was trying to make elegant, simple modern homes accessible to the middle class. That was one of the things he did that was pioneering: democratizing design and architecture. Neely:Initially, we had grand ideas to do some renovations or extensions, and then the recession hit and everything sort of flatlined. In a way, it turned out to be a good thing because it made us sit back and appreciate what the house had to offer as it was. We saw it in a new light and turned our focus to the furnishings. 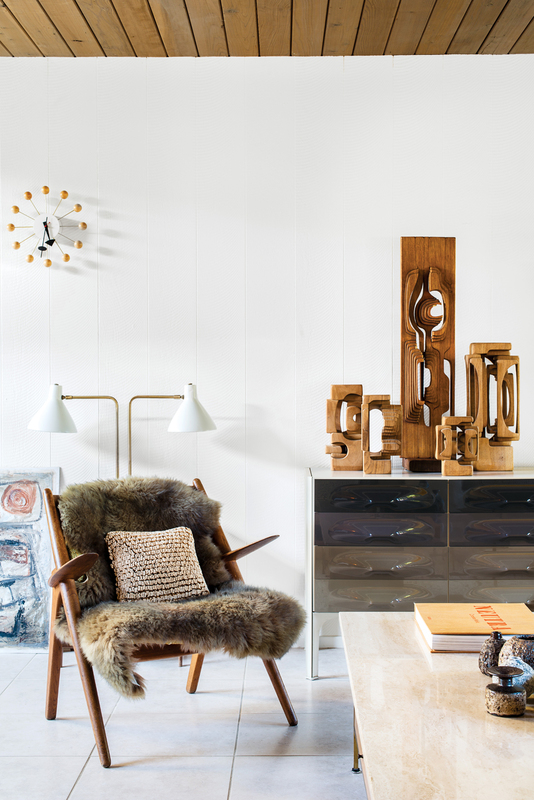 We brought a lot of things to this house from Chicago—I started collecting mid-century modern and Danish when we lived there in the early ’90s. I got many pieces from Knoll, Herman Miller, and the Merchandise Mart, and the antiques shops were filled with stuff at the time. The Danish chest in the living room is from Chicago, as are the Hans Wegner oak Sawbuck chairs—those are from Wright, the auction house. No one was bidding on them, so I did. Kefalides: When we were in Chicago, it was a time of discovery. We were so excited about purchasing some of those things, like the Raymond Loewy buffet, which also came from Wright. We rented a truck from Home Depot and moved the buffet ourselves to our apartment—it’s really heavy. It’s spectacular and has a lot of sentimentality for us. I tend to get attached to things that were real aspirations at the time we acquired them. Neely: Many of those pieces work so well in these rooms, like the Paul McCobb table, which I found when we were living in New York. When I placed it in our living room here, I realized it’s basically the structure of our house. The travertine top looks like the roof, the drawers resemble the house itself, and the negative space, the carport. Kefalides: There’s a dilemma with these houses—on one hand, we realize we don’t need a lot of space and can live comfortably with furnishings from the same era, which were designed to fit in a small space. But some areas, like the kitchen and bathrooms, really do need updating. We are sensitive about changing the footprint of a home that has specific sight lines and light entry points, and we would never alter it in a way that disrupts those features. We’ve talked to a lot of architects, and the back-and-forth usually leads to more indecision, actually. Neely: Our general approach has been to keep the house up and bring areas to life by putting up a new wall covering or adding furniture. 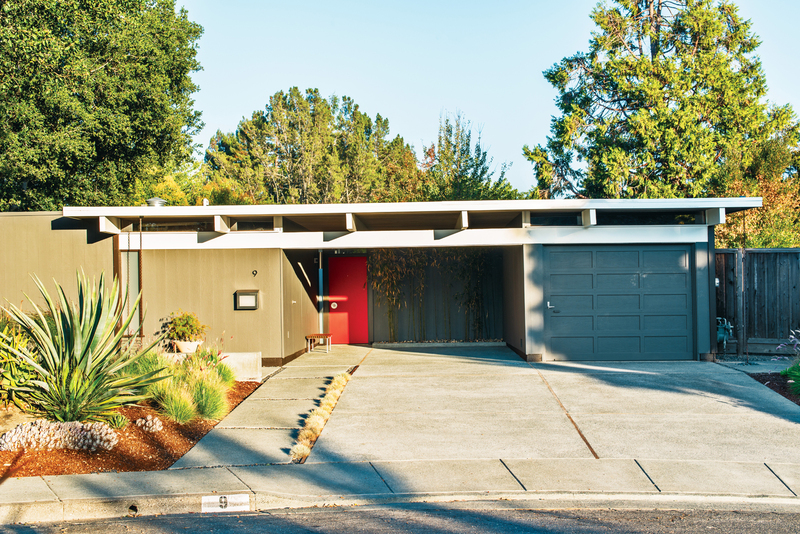 The integrity of the architecture depends on the details Eichler put in, which should remain. I’m on the architectural review committee for the Lucas Valley neighborhood, and we have an ongoing debate in the community: What would Eichler have done, and what would he have thought of this or that? The whole modern idea was always to move forward and not feel constrained by the rules—that’s what modernists were revolting against when they came up with the modern ethos. I like to think Eichler would have wanted this neighborhood to evolve in a modern way. Kefalides: We have to retain elements of Eichler’s mid-century modern aesthetic but still make sure that the house is functional for 21st-century life. It’s like two kinds of modernism coming together. I don’t think Eichler and his fellow modernists would have wanted their homes entombed; instead, they would rather have them grow and develop organically.